Case Study 1: 95 images were used to train DeepLabCut to predict 22 labels on the chestnut horse (video 1). Automatic labeling was then performed on the full video of chestnut and a previously unseen brown horse (video 2). Video 3 is taking DeepLabCut, first trained on the chestnut horse (video 1), then adding only 11 labeled frames of Justify on a race track, re-training briefly, and applying the automatic labels to the full video. Note the differences in background, change of viewpoint, as well as the different relative sizes of the horse in video 3 vs video 1. Case Study 2: rat skilled reaching assay from Dr. Daniel Leventhal's group at the University of Michigan. The data was collected during an automated pellet reaching task, and it was labeled by Dr. Daniel Leventhal. We used 180 labeled frames for training. Case Study 3: Left: Mouse locomotion. Data, labeling, DeepLabCut training & video generation by Rick Warren in Dr. Nate Sawtell's lab at Columbia University. Shown here are the 3D movements from a head-fixed mouse running on a treadmill as collected by one camera (plus a mirror). One network was trained to detect the body parts in both views simultaneously. He used 825 frames of data for training (fewer labels would give similar performance). Here is more information and open source building designs for Rick’s KineMouse Wheel. Right: Electric fish freely swimming with a tether. Data, labeling, DeepLabCut training & video generation by Avner Wallach, PhD, a post-doc at the Sawtell lab. He used 250 frames for training. Case Study 4: James Bonaiuto, PhD (a postdoctoral fellow in the group of Dr. Pier F. Ferrari at the Institut des Sciences Cognitives, CNRS) trained three networks - one trained on each view with ~120 training frames per view. The 3D trajectories were extracted by using the camera calibration functionality in openCV to compute a projection matrix for each camera and then using these to reconstruct the 3D coordinates from the labeled 2D points in each view. 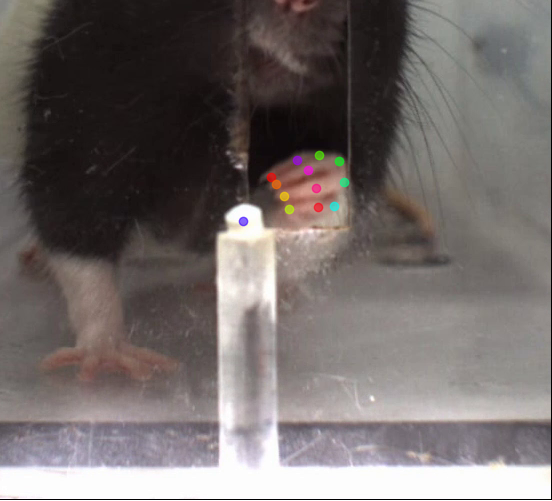 Case Study 6: Multi-whisker tracking. Andrew Erskine, PhD, a postdoctoral fellow in the lab of Dr. Andrew Hires labeled ~300 frames to track multiple whiskers of a mouse. Case Study 7: Thomas Vaissière, PhD from the Scripps Institute in FL is using DeepLabCut for pupil tracking. 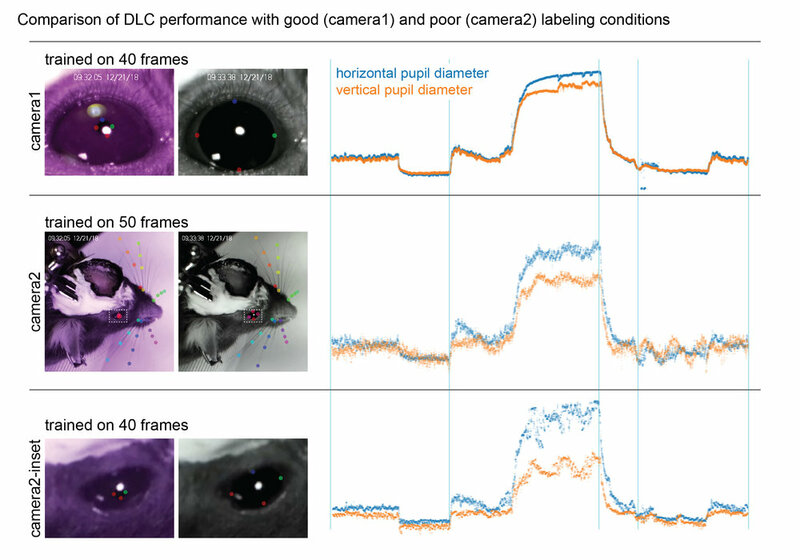 he compared low-resolution and a high resolution camera and obtained a similar performance, even with training for only 40 images (also see pupil tracking from the International Brain lab, here). Lastly, please do not take images or videos from this website without providing credit to the authors of the videos!